The concept of measurement as related to geometry typically begins with a basic understanding of determining the distance around the outside of various polygons. Understanding this distance can provide useful information. In two-dimensional shapes, the perimeter is the distance around the shapes. Perimeter refers to the entire distance around all sides of the polygon. It does not include any of the information inside the shape. Perimeter is reported in linear units. This is because though polygons are two-dimensional the distance around the shape is one-dimensional. Linear units are units such as inches, centimeters, feet, meters, etc. Consider that the perimeter represents the distance it would take you to walk around the outside of a shape or area if your steps were each one unit in length. In other words, if you walked around the outside of a basketball court and it took you two hundred sixty-five steps to complete the activity, then the perimeter of that basketball court would be two hundred sixty-five steps. Now, if each one of your steps was one foot in length, it could also be said that the perimeter of that same basketball court is two hundred sixty-five feet. Sometimes, it is not realistic to walk the entire distance around an area or shape. Still in many situations a step is in no way a standard measurement. This means, that a step length is often different for each individual. For measurements such as perimeter, it is imperative to speak in terms of more standard measuring tools such as: inch, feet, centimeters, etc. To find the perimeter of a polygon, you must know the measurement of all of the sides of the shape. Once all of the measurements are known, it is a simple process to find the perimeter. The perimeter is the sum of all of the sides of the polygon. In other words, in order to find the perimeter, you simply add up the length of all of the sides. Often it is helpful to create a drawing when beginning to calculate the perimeter. Drawings of this nature do not need to be drawn in any accurate manner; instead they are simply used as a guide to help have a better understanding and representation of the distance being considered. By saying that they do not need to be accurate, it simply refers to the fact that the drawing does not need to be drawn to scale. In other words, if a rectangle is said to be seven feet long, it is not necessary to draw an actual rectangle seven feet in length. Instead, it is enough to draw a regular rectangle and label the sides with the appropriate measurements. The perimeter of this rectangle would be 2in + 8in + 2in + 8in = 20 inches. In some cases of regular polygons, like a square, if you know the length of one side you can find the perimeter without the other sides being identified. As the sides of a square are all the same length, when finding the perimeter you simply would add the same number over and over until you had covered all sides of the polygon. Since we know that all sides of a square are the same, all sides must measure 2 inches. Therefore, the perimeter of this square would be found by 2in + 2in + 2in + 2in = 8 inches. A different way to find the perimeter of a regular polygon (such as a square or a regular pentagon) is to multiply the number of sides by the length of one side. Here is an example using the same square as above. There are 4 sides and the length of one side is 2 inches. 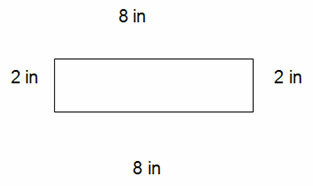 Therefore, the problem would look like this: 2in x 4 = 8 inches. Remember though, this method only works for regular polygons. Some shapes this multiplication method could be used with successfully include: square, equilateral triangle, regular pentagon, and a regular hexagon. If you are in doubt about whether or not a shape is regular, it is safer and better to utilize the addition method to find the perimeter. Sometimes it is simply easier and more efficient to simply add all sides of the rectangle, but this provides another method for arriving at the perimeter of a rectangle. Remember as with any mathematical formula, it is required that the mathematical operation located within the parentheses be completed first. There are numerous real-life examples where finding the perimeter would be a helpful exercise. One example would include fencing in a yard. In this case, before the owner would go to the local fence supply store and purchase the fencing, it would be necessary to take measurements of the entire area to be fenced. The yard could be any shape and still be successfully fenced if all of the side measurements are added together to find the perimeter. Perimeter is easily found by measuring the distance around the outside of each side of a shape or area and finding the sum of these sides. However there are other formulas and methods which can be utilized to accurately calculate the perimeter. A simplistic method to find the area involves the use of a string or yarn. In this situation, a piece of string is stretched around the outside of each side or the area for which the perimeter is being determined. The string is then measured using a yard stick or another measuring tool to determine the perimeter. Another method, as described earlier is to step off the distance around the area being measured or to even draw a visual representation of the area for easier interpretation.